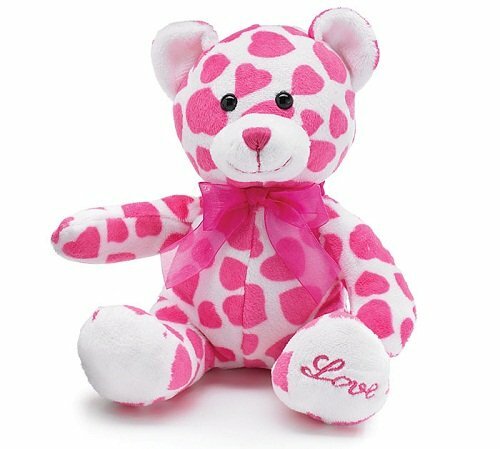 Surprise your sweetie with this adorable 8" plush Hearts Bear. So soft and huggable, he melts even the hardest of hearts ! Hes white with pink hearts all over, the word "Love" is stitched onto his left foot and he wears a matching silky, pink bow. He makes a perfect gift for any occasion but especially Valentine's Day. White with pink hearts & a bow. The word "Love" is stitched to his foot. The perfect gift for your Valentine ! My girlfriend likes this bear and lays in bed with it. If the girlfriend is happy, I am happy, therefor this toy gets 5 stars.